Want to treat the entire family to some good, wholesome fun? Look no further than K-Bay Lanes, the ideal environment for singles, couples and families. 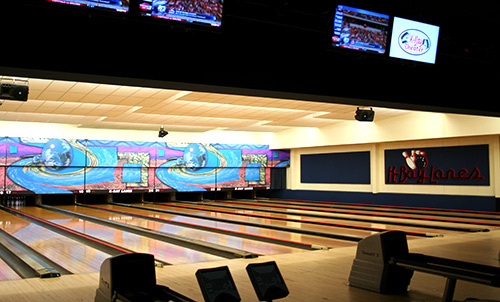 The center’s 24 lanes feature automatic scoring, video game room, party room and vending machines. There’s also an eatery with an expansive menu. Click here for Strikers Grill & Tap. NEW at K-Bay Lanes – Lunchtime Bowling! You can now bowl during lunch on Monday, Wednesday & Friday 1100-1400. Stop by, grab some lunch at Strikers Grill & Tap and bowl a couple of games with your buddies! Relax and unwind while enjoying drinks (soft and alcoholic) and bowling. Bowling Lanes and Striker Grill open to all hands. It’s a glow-bowl dance party every weekend at K-Bay Lanes! 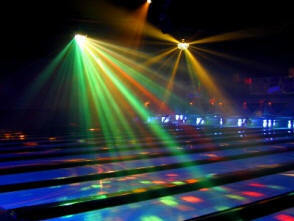 The hottest music of yesterday and today fills the air as you bowl under a cosmic array of lights. Black lights and hazers create a glowing, optical translucent environment. You’re guaranteed not to strike out with your keiki if you book a Birthday Party Package at the K-Bay Lanes. For an affordable, electrifying birthday extravaganza, a Bowling Birthday Party is right up your alley. Bowling is recommended for ages 4 years old and older. Extreme Bowling Party Packages available on Saturday, 1200-1430, 1500-1730 on Sunday, 1500-1730. Packages 1-3 are $14.50 per child and includes 2 games of bowling and shoe rental. Package 1: Includes Grilled cheese sandwich on Texas toast and a small soft drink. Package 2: Includes Dino nuggets, fries and a small soft drink. Package 3: Includes Eisenberg hot dog and a small soft drink. Package 4: Includes 2 games and shoe rental. Bowling package only $8/person. The party room is available for additional $25.00 for 2.5 hours. In following the Marine Corps order, no outside food other than cake and ice cream will be allowed. Patrons who bring in cake and ice cream must supply their own serving and eating utensils. We will chill or freeze items for the customer. The Eastside Juniors Bowling League has ongoing registration every Saturday from 0900-1100 at K-Bay Lanes. For more info, email ikukino@gmail.com or call 254-7664. See PDF for additional information.